Find hotel near Palace Of The Inquisition .. This Spanish Baroque colonial-style villa is one of the most historically significant buildings in the old town of Cartagena. Completed in 1770, it is built from white brick, limestone and wood. It was the seat of the Holy Office of the Inquisition. Here the Inquisition put Semites, non-Catholics, and suspected black magic practitioners to trial. 800 people were publicly executed. Prior to the visit of the Pope, the palace used to exhibit instruments of torture alone. Today the first floor exhibits include pre-columbian pottery, historical art and antiques, and weapons and interrogation equipment. The second floor is used for temporary exhibitions that you can find out about from the attraction website calendar. And the third floor focuses on the history of the city. Student discounts available if you contact them before your. The Museum of the Inquisition is a place that gives you pause to think. Cartagena and much of Latin America possess so much beauty but beauty built on a dark past. The displays on the first floor were well presented with good signage in English and a even more comprehensive in Spanish. The second floor covers more of the history of Cartagena but unfortunately their is quite a bit less English in the event that your Spanish isn't great. Overall it was a good experience having gone with our three children (ages 9-13), all of them asked good questions stimulated by the displays and information presented. Tough to ask for more than that from a museum as a parent! We took this tour off a Carnival cruise. Our guide spoke excellent English which made our visit more enjoyable since most signs were in Spanish. 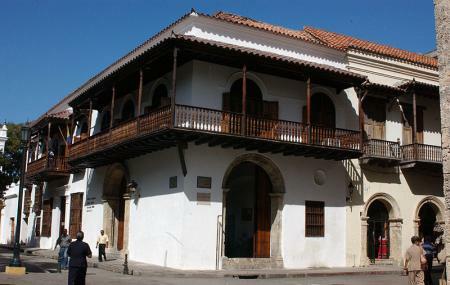 The small museum gave a overview of Cartagena's history. No AC but the gardens were refreshing. I am glad we saw it and would recommend going. We plan to visit the Gold Museum (Museo del Oro Zenu) but it was closed for renovations so we decided to walk around and we ended up at the Cartagena History Museum (Museo Historico de Cartagena). We highly recommend opting for an audio guide since there are just a few annotations in English. Inside this museum, there is also the Palace of Inquisition showcasing historical artifacts. For more pictures, feel free to visit my Instagram (IG: kelledstyle).